We need your help! 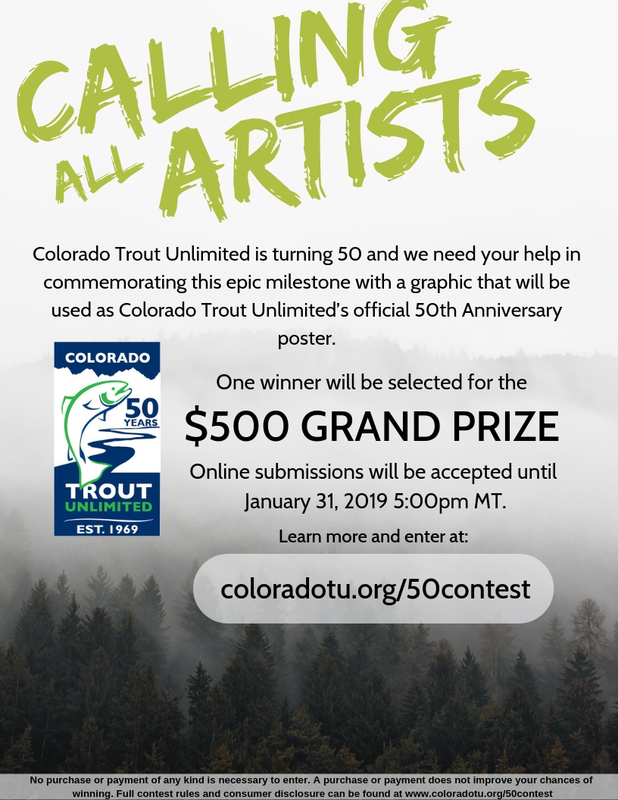 We are turning 50 and want to help commemorate the milestone with a graphic that will be used as Colorado Trout Unlimited’s official 50th Anniversary poster. We are looking for a creative and eye-catching poster design that conveys the message of Colorado Trout Unlimited’s mission to conserve, protect, and restore coldwater fisheries and their watersheds. This can be either a literal interpretation or more abstract. Judges will be considering the quality and style of the design in regards to the theme (fish, rivers, outdoor recreation, and boots-on-the ground work) as well as its overall aesthetic. Text recognizing Colorado Trout Unlimited and/or it’s 50th anniversary is preferred as being integrated into the design. Some examples of that could be: Colorado Trout Unlimited; 50 years protecting rivers, and we’re just getting started; Established 1969, or Est. 1969. This is not required, but if not included, we may add our organization’s name and 50th slogan at the bottom similar to gallery art prints that will not alter or change the artwork. You can also see our 50th anniversary logo here. Please make sure you read the Contest Rules & Disclosure and understand that by participating in the contest, you agree to them. One winner will receive a monetary prize of $500 cash, statewide recognition throughout our 24 chapters, a “Meet the Artist” feature to be distributed on our website, newsletter, social media, and High Country Angler E-Magazine, and two tickets to the Colorado Trout Unlimited Annual River Stewardship Gala in downtown Denver, March 7th 5pm-9pm ($300 value). All submissions will receive a free one-year introductory TU membership. December 7th, 2018: Contest announced and submission portal opened. January 31, 2019 5:00pm MT: End of contest and no more submissions will be accepted. February 15, 2019 : Winner will be contacted by email first, then a phone call if necessary no later than February 15, 2019. February 22nd, 2019: The winning original art piece must be mailed or hand delivered to Colorado Trout Unlimited at 1536 Wynkoop Street STE 320, Denver, CO 80234. Digital submissions may be sent to CTU online. March 7, 2019: Winner and guest are invited to the River Stewardship Gala in Denver, Colorado where their original piece will be featured and up for auction in support of the organization. Under 18? Download, sign, and upload to the submission form above. All questions may be directed to Andrea, CTU Communications & Membership Coordinator at andrea.smith@tu.org. No purchase or payment of any kind is necessary to enter. A purchase or payment does not improve your chances of winning.